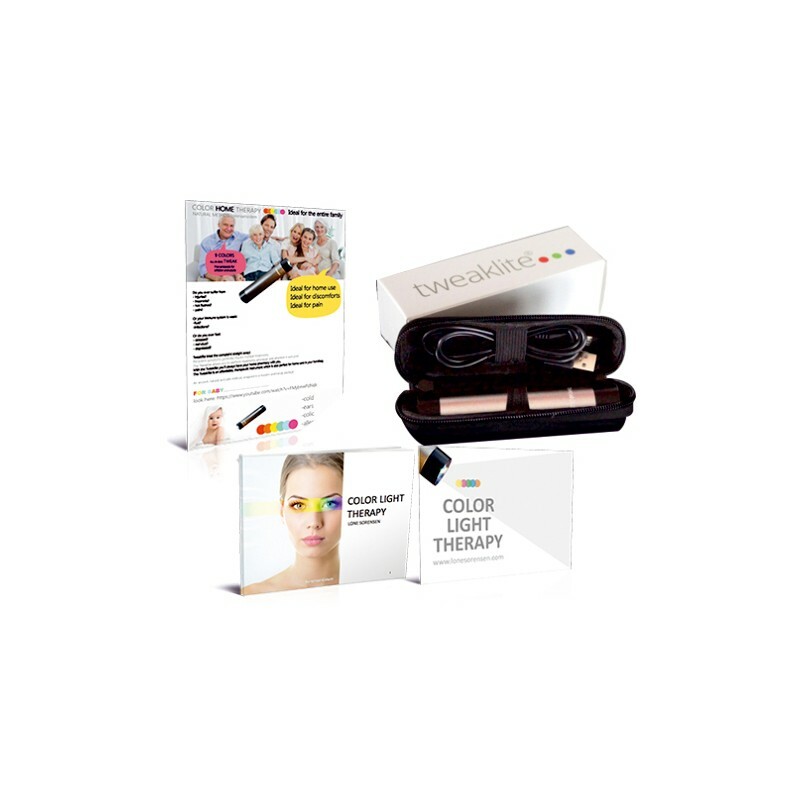 ﻿ Colorterapia - Tweaklite y curso - IRFI de Lone Sorensen sl. En esta oferta por la compra de Tweaklite se incluye el Curso completo. El Tweaklite es un instrumento asequible, terapéutico que también es perfecto para la atención domiciliaria y es ideal para llevar en el bolso. Contiene: Colorterapia -1 Tweaklite y material de curso, instrucción y protocolos. Innumerables beneficios para todo el mundo! Se le permite realizar tratamientos cuando y donde mejor le convenga! Con la Tweaklite siempre tenga su farmacia en casa. tutoría a distancia y un diploma que se entrega una vez superados con éxito los exámenes. The Tweaklite is very handy and extremely easy to use. In the manual that comes with it you will find all the information you need to make it work. The Tweaklite® is a high-quality instrument used to apply colored light to body zones specified by an expert practitioner. Always follow the guidelines of this practitioner. The Tweaklite is programmed with the Sørensen color set.
! Never look directly into the lens when the Tweaklite is on as the light can temporarily dazzle. Make sure the Tweaklite is fully charged via a standard USB charger or PC. Charging: red, full = green. Use only the supplied mini USB cable. To start the Tweaklite, push the button for 1 second, do not hold the button. After the tone push the button again briefly to skip through the colors. Each color stays on for 20 minutes. After that, the Tweaklite shuts of after 4 minutes. Manual shut down after holding the button for 4 seconds. Extended color manual, download here. Charge the Tweaklite until the green light is on or blinking. After full charge you must be able to use the Tweaklite for treatmens for in total at least 90 minutes. Charging could take up to 12 hours from a PC. A separate charger is faster. Often the Tweaklite not charged. Connect the Tweaklite to a PC or an external USB charger. For long-term charging, an external charger recommended because if a PC is in “sleep mode”, also the power of the USB ports will be disabled. There may be multiple led’s visible on the rear side of the Tweak Lite. During the charging process they will switch off and the red LED remains on. Charge untill the green led is on and restart (see quickstart). Switch the Tweaklite off for a period of time and then it will work again.Sometime this is caused by multiple pushes on the button while performing a task. The Tweaklite is protected by a “watchdog” to restart again. The Tweaklite has a built-in color test. These are the colors red, green and blue and white. If there is no or only one Tweak installed, the test can be carried out by holding the button for 4 seconds.If at startup, the button is held to long, you will not get expected Tweak, but the test colors. Switch the Tweaklite off by holding the button for 4 seconds and wait till all the lights on the back are off. Then start the Tweaklite on by pushing the button briefly and then release. Wait for the tone. Then press the button again briefly to start the treatment. Follow the instructions in the Quick Start or the tutorial. 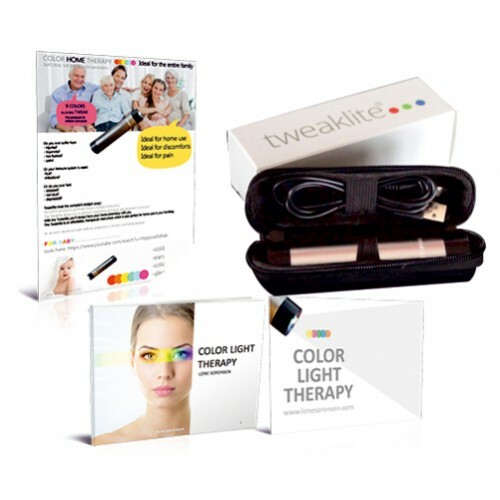 The colors of the Tweaklite are composed of the basic colors red, green and blue. All other colors are combinations, a mix of these colors. I.e. yellow is a mixture of red and green. You may see the colors separately if projected on a light surface. Sometimes the difference between orange and yellow cannot be seen well because if you look directly into the light. That is because your eyes are very sensitive and will be overamplified. These colors also have the highest energy. If you want to see the colors, shine the colors in a white cup to see the mixture. The special indigo in the Sørensen range only contains only blue. If you need more information about the function of the Tweaklite, contact us with a description of the problem. We can provide online assistance. Please download the program “Teamviewer” here and send us an e-mail for an appointment. You can also call me on Skype paul.brobbel.